The Vancouver Canucks have embraced a youth movement of sorts in the early stages of this season. To the organization’s credit, they’ve managed to at least make an initially successful foray into bridging the gap from one era to the next by getting a handful of their notable prospects some NHL reps. And they’ve done while remaining competitive. The early returns on the youth influx have been rather encouraging. Jared McCann is amongst the team leaders in goals, Jake Virtanen has flashed the sort of powerful play both on and off the puck that may justify his draft position yet, and Ben Hutton has been a standout puck-mover from the back end. If those guys have been given a chance to dip their respective toes in the water, though, then Bo Horvat has been tossed into the deep end of the pool without a life jacket. Ever since the team’s de facto number two pivot Brandon Sutter went down with injury, Willie Desjardins has entrusted the 20-year-old Horvat with a markedly tougher, more onerous role than the one he thrived in towards the end of last season. The manner in which Horvat has handled this increase in responsibility has been a mixed bag at best, leaving fans wondering whether he’s been struck by the much ballyhooed ‘sophomore slump’. Beyond Rostislav Olesz sticking out like a sore thumb on some shallow Florida Panthers side, what quickly becomes apparent from scanning the list of names is that the types of guys who undertake this sort of responsibility this early in their careers tend to become fine players more often than not. Though it’s tricky to separate cause and effect here, there’s probably a valid reason as to why we don’t typically see coaches feed their players to the wolves to this extreme, except in the rare instances. It generally takes time to cut your teeth in the league before you’re able to stay afloat, let alone be effective, in more demanding game situations. Unfortunately for the Canucks, with Sutter’s injury limiting their other options, they haven’t necessarily had the luxury of sheltering Horvat. Of players aged 22 or younger this season only Jean-Gabriel Pageau, Jonathan Huberdeau, Brock McGinn, Sasha Barkov, Radek Faksa, Chris Tierney, and Alexander Wennberg are currently sporting a more defensively skewed team-relative offensive zone start percentage. To say that Horvat has buckled under those minutes would be fair, though he’d surely be looked upon in a better light if the underlying percentages weren’t conspiring against him as well. Not only have none of his 36 shot attempts (21 of which hit the target) at five-on-five found the back of the net, but his .894 on-ice save percentage also happens to be the lowest figure for any Canucks skater. While the even strength issues are within reason, the sledding has been noticeably tougher and more pronounced when down a man. The ~120 shot attempts/60 that the Canucks are surrendering when Horvat is on the ice in shorthanded situations are the 13th worst rate for any player with at least 25 minutes to his name. He’s been a big reason why the team’s penalty kill as a whole, which used to be among the club’s strong suits, has went into the tank this season as Thomas Drance was wise enough to forewarn all the way back in June. Interestingly enough, if you expand the age cutoff to 21 for the list of players highlighted above it includes a very young Ryan Kesler, whose ’05-’06 campaign happened to be his second year in the league (following a fairly brief cameo prior to the lockout). 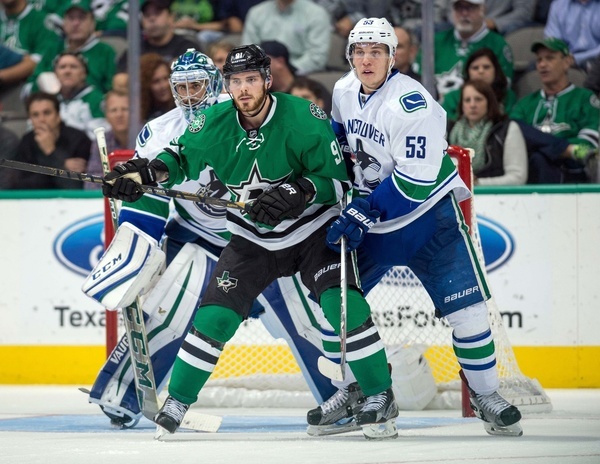 On that incarnation of the Canucks, which happened to be in a state of transition itself, Kesler was asked by Marc Crawford to eat a heavy dose of defensively-oriented shifts, and penalty kill time. He wound up scoring just 10 goals, registering 23 points, and surrendering a high percentage of shot attempts whenever he was on the ice. If you squint just hard enough, you can begin to make out the similarities between then and now. For whatever it’s worth, an injury took a large chunk of Kesler’s following season, but he managed to make a noticeable leap in both even strength and shorthanded situations during his time in the lineup. The next year he eclipsed 20 goals for the first time (and went on to do it in each of the following 6 full seasons). The point here, of course, is to preach patience. I still believe that the only way a player can get better is if he gets a chance to either succeed or fail in the first place. There’s no amount of practice time or video work that can replicate a healthy dose of in-game reps. 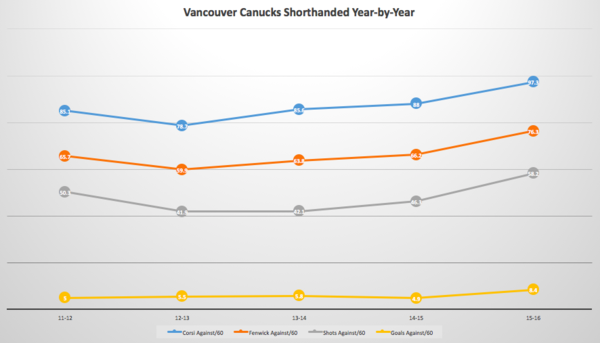 Given what we’ve seen from Bo Horvat early on in his career, there’s no reason to believe that he won’t eventually refine that area of game to the point where he’s potentially even an ace. The Canucks are banking on that evolution happening over time for the sake of more than just this season, or the next. Great article. The fact that Horvat’s been withering to some extent under the added responsibilities is understandable — he’s also had a rotating group of wingers including at times Virtanen and Baertschi so lots to take on for himself both offensively and defensively. Because the Sedins are continuing to produce it’s taken some of the pressure off — if only Vrbata would also stop being so snakebit it would make things a bit easier on Horvat. Thanks for this great article. I’ve been wondering how Horvat compares to past players that were in the same situation. It would be sweet if Horvat eventually morphs into one of them. Those are the types of players that winning teams have. Now if only we can find a replacement for the aging Sedins . . .